Does anyone know if someone still manufactures extensions for radiator valve handles? I have a number of valves installed inside window seats and such, that originally had extensions to cranks located on the outside surface of the seat. These 1920's backless valves are shot and have to be replaced, but the extensions are not removable. My options are then to install a common valve and have it be difficult to access inside the seat, or . . what? So, like universal handle replacements, does someone make extenders? Post some pictures. Let's have a look. I'll have to see if I have anything useful, photo-wise. The apartments in this building all have radiators built enclosed within window seats, and the valves are mounted with the stem horizontal. The valves and piping are perhaps 6" behind the wood-panel face, and the valve (which I believe is a Dole, packless of some ilk) has an extender which protrudes through the wood with a small cast crank on the exterior for operation. Although painted over, there appears to be a chrome-plated index plate on the face and a corresponding bearing bracket of some sort on the back. So far I haven't been able to figure out how the extender is even attached to the valve stem, let alone remove it for reuse. And I've had no luck opening the valve to see how the packing was done originally, whether packing with a spring or a syphon bellows, or whatever. But this is all rather moot, as most of these valves have leaked so long as to have corroded all the related parts (also the internal disc is shot - I could see after I removed one from the rad). It's just time for new valves. So I'd be happy if I could take the handle off a new valve, somehow secure an extension to it, and mount a standard handle on the outside of the window seat. The alternative, as I've said, is a little access panel for someone to reach in and adjust the valve. So, does someone still make an extension? They did back in the day. I'd hate to have something custom machined. @Harry_6 : Mepco may still sell extensions of a sort which may work for you. Part # C910. The only decent photo I have. It shows the stem extension going off to the left where the bearing bracket is barely visible around it on the wood. The valve is obviously corroded. Sorry Gordo, the google machine turned up nothing with that number, and Mepco's site doesn't have a search function. Hello, I see a square head of a screw on the cylindrical attachment to the valve. Might simply loosening that screw allow you to insert a square shaft, that could be cut to length... sort of like what we used to find with floor furnaces?? I noticed some time ago that Mepco's web site was a zombie. No one called back or in any way answered my inquires. Your best bet may be to try and find a local Mepco rep, or if none found, try State Supply. The C910 number is right off the fairly new package of a Mepco stem extension kit I have for the #740 valve as I type this. I remember it being pretty pricey and having a long shipping time, that is to say- par for the course. Not surprised there is nothing (or dead-ends) on google, either. I'll have to call my Mepco guy. As far as that shaft set screw, I tried on a previous valve and had no luck. Even though the collar appeared loosed and wiggled, no power on earth would pull it from the valve stem. Even if I removed the screw completely. Similarly, there was no way I could get the cover piece that should conceal the packing off - even when it was apparently loose. I've never seen this valve, but there must be some clever proprietary way of disassembly. It reminded me of the screw-on collar used to secure old door knobs, but it doesn't seem to be that either. Hard to tell from the picture, but that stem is pretty beefy - perhaps 1/2" diam. Whoa, you sure have yourself a challenge there! I'm only somewhat acquainted with 1920s Warren Webster extensions and and have some stock in Dunham (Mepco) stuff. That valve does not look like a Webster. Most stuff of that period seemed to favor bonnet tops that were octagonal and not hex. I know, this is an odd one. I believe the first one I did (which after 2 hrs of trying to get the bonnet and/or extension off I gave up on) said "Dole." I know Dole made a bunch of stuff, but I couldn't find a drawing of this one in my archives or on the web. It's moot, though, as far as fixing it, since they aren't brought to my attention til they're leaking so bad they're shot - and the composition disc has disintegrated - so new valve it is! Now I just need to find an extension! Speaking of Dole, I recently came across a Dole main vent similar to a cast-iron Trane (on a Mouat system with its original 1910 boiler and a very early vacuum upgrade). Dole #9. I couldn't find any info on its capacity, but boy, it dumped a bunch of air! I would say at least as much as a Gorton #2, but with the vacuum disc. Bathed it in hot vinegar solution over night, a quick rinse, and works great. I worked on an old farm in the early 60's. The owner was a guy who lived and worked thru the depression of the 30's. He was very creative and inventive building his own machinery from the iron pile. He wanted hot and cold water accessible on the outside of his house. Frost proof hydrants weren't in the picture at the time. He had globe valves inside with the handles parallel to the inside wall. An extension rod came thru the wall which had a 2" x 1" 1/4" plate welded to the rod......as in the letter "T". The plate had holes drilled with screws and nuts capturing the valve handle. 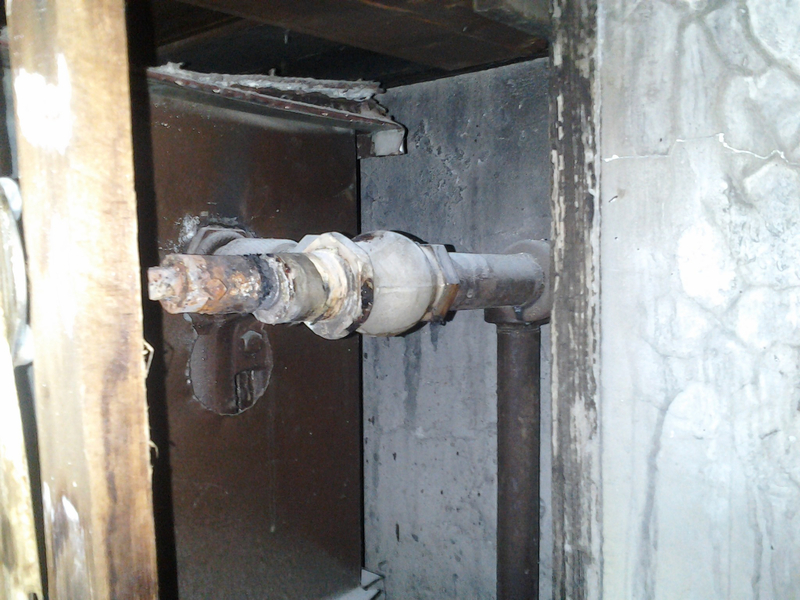 The outlet of the valve was piped thru the wall with hose adaptors outside. The exterior handles were recycled from the scrap pile. Maybe even welded chain links....IIRC. If you could salvage your extension rods and handles and attach some form of plate to a new valve. Or browse thru the plumbing stem rack at the hardware store for some form of set screw coupling. Maybe drill out a coupling to fit the original extension. You have to picture something in your mind. The welder/farmer inventor could come up with something and still use your original handles...unless you like the chain link look. Good point! I have been thinking about adapters and such. Whatever might be mostly off the shelf to make life easier, since I suspect I'll have more to do. As a point of general interest, I eventually did find drawings of those Dole valves. They included (of all things) ball bearings for smooth operation, and which guaranteed that when they did eventually leak the bearing would seize up like a mother and never turn again!